Sewing for baby, either a boy or girl is easy with this classic pattern! This cute sunsuit pattern has vintage sewing appeal while being a timeless baby pattern. The sunsuit pattern features a bib front, elastic legs, crisscrossed straps and optional inset in bib front. When sewing for baby boys, you can add a machine embroidered design to the front bib, add a felt applique or even a smocking design to the inset style of the patttern. When sewing for baby girls, you can hand embroider the Mermaid design provided, add your own machine embroidery design or even add smocking design to the inset version of the pattern. You can also add girly ruffles to the back of the baby bubble and rickrack trims. 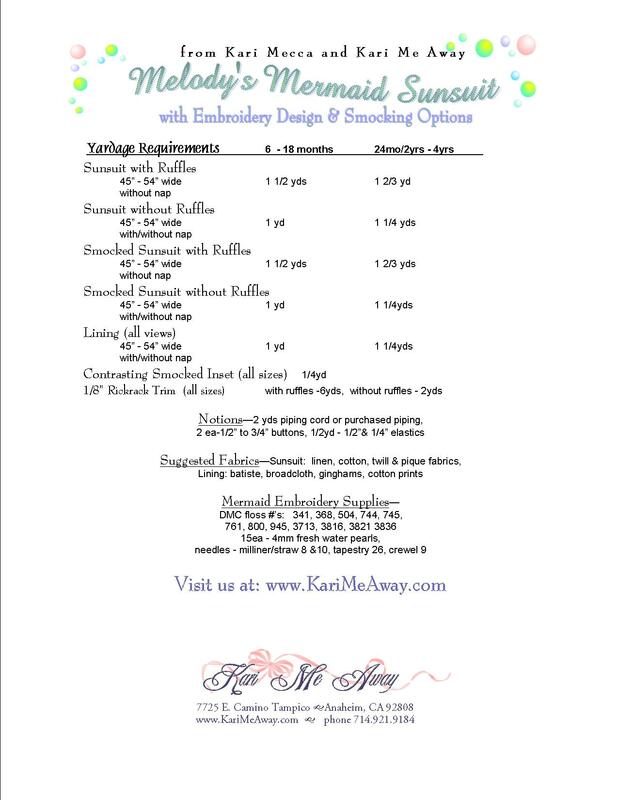 Complete instructions given to sew the hand embroidery designs, to add sewing trims and to make and sew piping trims. Shown made in a handkerchief linen with rickrack trims, but would also be cute in print piques, gingham, quilting cottons and with Whimsy Stick Trims. Also available: Melody's Mermaid Sun Suit Kit!